Conmark Systems Inc. is proud to announce the NEW Chlorine Dioxide Analyzer based on their success with the proven Duralizer-NIR near-infrared technology. The Duralyzer-NIR ClO2 Analyzer is a turnkey solution for carrying out chemical analysis of Residual Chlorate, Residual Sulfuric Acid and ClO2 in Chlorine Dioxide production plant. The standard configuration supports one or two sample lines. The system is based on the DURALYZER™ series of industrial spectrometers. The analyzer package consists of an industrial spectrometer configured for chemical analysis. 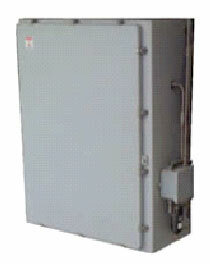 Sampling hardware is connected to Generator and Absorption Tower outlets. Sampling and cleaning is completely automated. The unique design of this system minimizes maintenance and system cost by eliminating the large number of moving parts associated with autotitrater technology and eliminating the high pressure or steam washing system used with refractometer approaches. Unlike single point measurements such as refractometers, conductivity meters and density meters, the spectrometer approach provides a complete component analysis such as an autotitrater system without the maintenance and cost associated with autotitrater systems. Chlorine Dioxide (ClO2) is the most important bleaching agent in the pulp and paper industry for Elemental Chlorine-Free (ECF) bleaching. Different bleaching sequences must be used in the production of various pulps. 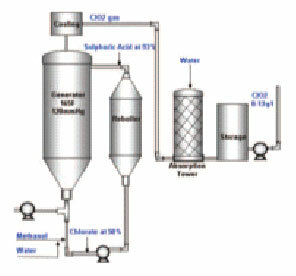 This depends on the pulping process used, the residual lignin content of the pulp, and the target brightness. 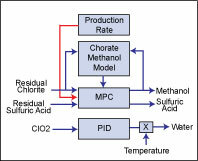 Key goals at most pulp mills include the optimization of Reaction Efficiency of ClO2 generators, the proper dosage of Acid (N) and Chlorite (M), as well as improving the control of vent-gas scrubbers for more uniform ClO2 concentration and reducing chlorine dioxide emissions into the atmosphere. Reliable and accurate chemical analysis of the ClO2 generation process is important for optimizing the efficiency and chemical consumption of it. Due to the complexity of this process, the Chlorate and Sulphuric Acid levels in the Generator need to be constantly monitored, after which an advanced control algorithm can then be fairly easily implemented. Even a small improvement in reducing the variations inside the Generator will result in a rapid payback from the DURALYZER-NIR based Advanced Control System. Advanced Control is required for optimum performance of the generator due to reverse relationships of the main chemicals Sodium Chlorate and Sulphuric Acid. Due to the complex relationship between the three main chemicals, a multivariable MPC controler is used to control Methanol flow addition and set point correction to H2SO4 flow.